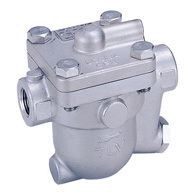 Free Float® steam traps that offer continuous discharge and are optimal for processes. Low pressure use, up to 46 barg. Free Float® steam traps that offer continuous discharge and are optimal for processes. Mid to high pressure use, up to 120 barg. Some models for use in main lines also available.